Amongst all the new Android-based announcements, Microsoft used IFA to announce two more Windows Phone products, some new accessories, plus news of the next big Windows update, Lumia Denim. I went along to Microsoft’s UK offices to find out more. Microsoft certainly doesn’t have any shortage of Lumia phones now, with models to suit all tastes and budgets – starting at as little as £50. With the next update of the operating system, users will get updated to Windows Phone 8.1 Update 1 and also receive new Lumia-specific apps and features. 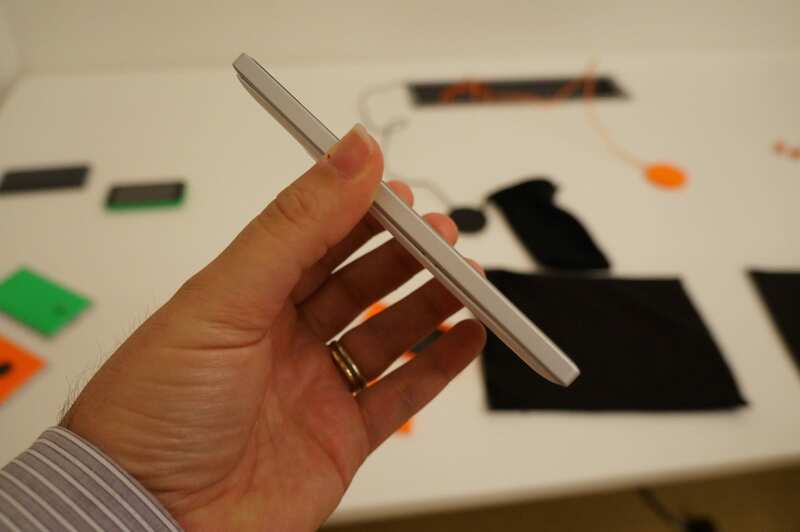 It forms the Lumia Denim upgrade coming before the end of the year. 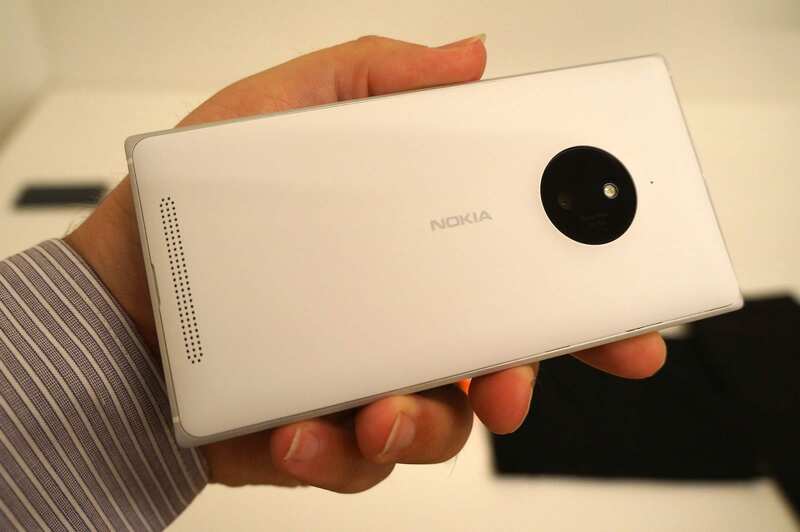 One new addition is Dynamic Flash that features in the new Lumia Camera app. Even after taking a photograph, you can not only apply the usual filters and tweaks (saturation, brightness, contrast etc) but now control the level of flash too, ensuring you get the perfect result. Let’s pause for a second and imagine how cool this is – just as when the Lumia 1020 launched with the ability to re-zoom and re-frame your photo long after you’ve taken your shot. Imagine you wanted to take a photo in low-light and had to choose whether to use the flash or not. Do you want to risk over exposing the face or object you’re photographic, or ditch the flash and risk the object being nothing more than a silhouette? Making that decision on a Friday night in the pub isn’t likely to end up being the right one, but it will prove just as useful in almost every situation where good lighting is not on your side. Dynamic Flash works by taking more than one shot – with and without the flash. This means you can now drag a slider to go from dark to light at any time in the future, to get the exposure exactly as you want it. Microsoft is also making a number of improvements to the start-up time from pocket to picture, as well as faster shot-to-shot times when taking multiple photos. Best of all, Lumia Denim and the associated camera software updates, which also adds 4K video recording to models equipped with Snapdragon 800 CPUs, will be coming to all phones before the end of the year. 4K videos can also be edited on the device, with the option to save off still images as standalone 8.3-megapixel photos. On older phones, you’ll be able to record in full-HD (1080p) and save off individual frames as 2-megapixel photos. But all that’s for the future, so what about the two new phones that were announced this week? 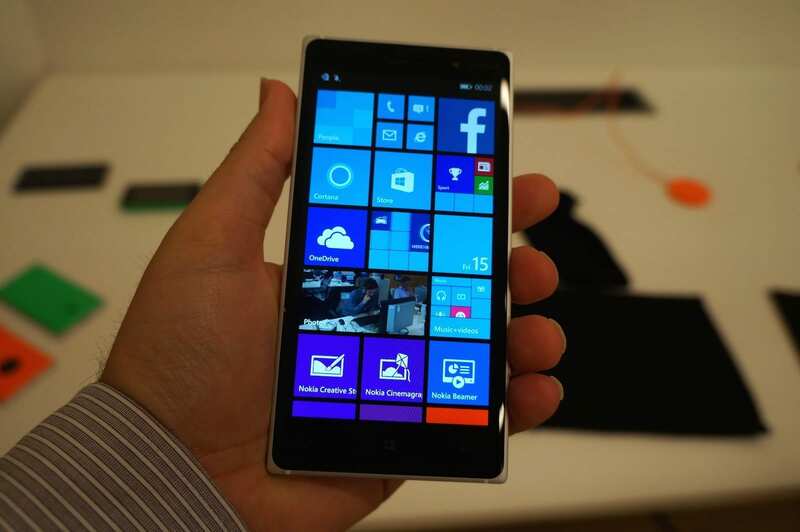 The new Lumia 830 sits below the flagship 930, but at a far more affordable price. Coming with a 5-inch 720×1280 pixel (IPS LCD) display instead of full-HD, the 830 has a PureView 10-megapixel sensor instead of 21-megapixels, but still has 4G and wireless charging support. It’s considered the ‘first affordable flagship’ and the price is kept down thanks to the use of a quad-core 1.2GHz Snapdragon 400 SoC (instead of Snapdragon 800), 1GB of RAM, 16GB of internal storage, and an external memory card slot. The 8.5mm phone has the thinnest PureView camera yet, while still having optical image stabilisation and Zeiss optics. There’s no black model, so you can choose instead between white, orange, or green. During the press event, a photo comparison was shown between the iPhone 5s and the Lumia 830, but not the Galaxy S5 that was, according to Microsoft, so bad it wasn’t even possible to show. Of course, the proof of the pudding is in the eating, so I’ll wait until I get a review unit before confirming how good the camera really is, but every PureView camera to date has been impressive so it stands a pretty good chance. The question is whether a 10-megapixel sensor can still offer the same flexibility as the likes of the 930, 1020 and 1520 sensors, which all have more pixels to improve the overall image, and allow the clever re-zooming feature to truly excel. Every time the pixels reduce, so too does this innovative feature. 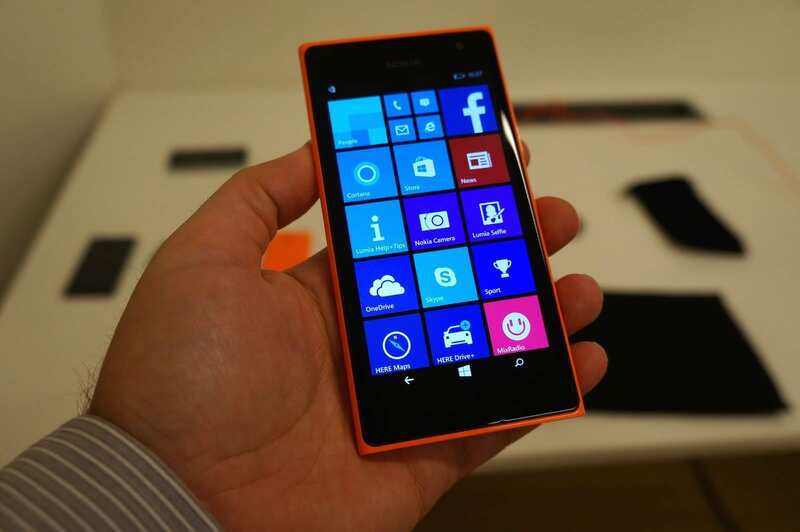 The Lumia 830 will sell for €330 before taxes, roughly equivalent to £315 with VAT. That’s SIM-free, so expect it to be cheaper on prepay and obviously a lot less if you opt for it on contract. That’s still not as cheap as Motorola’s new sub-£150 Moto G Second edition, also with a 5-inch display, but the Motorola lacks 4G and has a camera that doesn’t offer the same functionality as the PureView camera. For an even cheaper phone, still with the Snapdragon 400 chip-of-the-moment CPU and a 6.7-megapixel camera, the new Lumia 730 (and a 735 variant) are another new two phones launched. Essentially identical in specs to each other, the 730 is dual-SIM 3G, while the 735 comes with a single SIM card slot but support for 4G LTE. The display is a 4.7-inch 720×1280 pixel AM-OLED screen, with Corning Gorilla Glass 3 and ClearBlack technology. There’s 8GB of internal storage and a card slot. The key new feature is a 5-megapixel, front-facing and wide-angle camera for better selfies. It isn’t just more pixels that improves things, as Microsoft has also added the ability to do things like take panoramic shots (just in case you want to, say, take a photo of yourself standing in front of a large room of journalists and bloggers), and do plenty of post production editing to make your picture look good. Editing features include enlarging eyes, enhancing eyes, toning the skin, softening the skin, slimming, teeth whitening. Basically turning yourself into someone different completely almost. Given how vain many selfie takers apparently are, it sounds like the perfect app and the standalone Lumia Selfie app is available now from the Windows Phone store, so if you already have another Lumia device then you can sample some of the delights right away. The improvements to the front-facing camera experience is also extended to Skype, promising better quality video calls. Pricing for the 730 and 735 will be approximately £210 and £190 for the 730 and 735 respectively, again SIM-free. Colours to choose from will consist of orange, green, white, and dark grey. At the event in London, we got hands-on time with the phones but without any of the new software loaded on, thus scuppering my chance to test out the new features until I get my own review devices later in the year. Some new accessories might help, such as the HD-10 Miracast receiver that can stream your Lumia phone to a TV or monitor. With a NFC plate that can be put next to your TV, a simple touch is all it takes to connect and see everything on the big-screen. The accessory works with any display that has a spare HDMI input. And with so many Lumia handsets supporting Qi wireless charging, either natively or with an optional cover, the latest ‘Smart’ wireless charging plate (DT-903) will not only charge your device, but thanks to its NFC reader, can also change the LED lighting to give notifications, like missed calls or a new text. 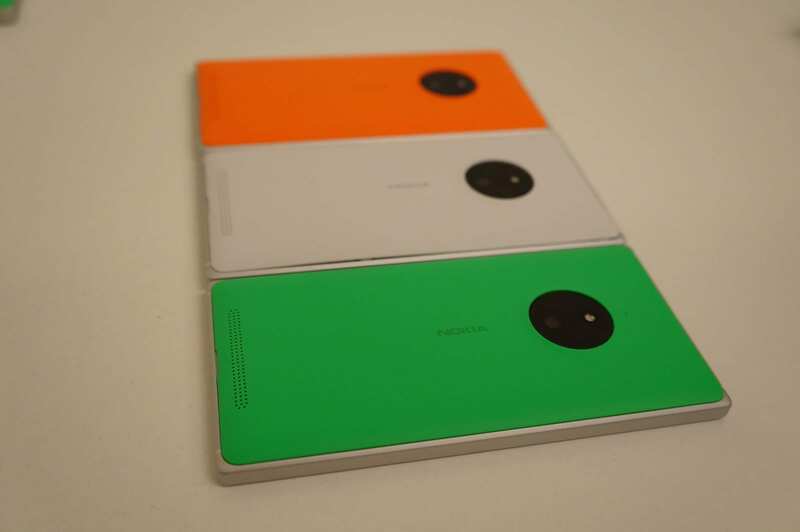 The new wireless charging plate comes in the same three colours as the new 830, namely orange, white and green. You might be reading all this and wondering what the point of all these new phones and software features are, given the tiny market share Windows Phone has, but Microsoft is obviously not giving up and with every OS update comes a load of new features that make it less of a major, if not insurmountable, switch. This includes the continuing educate of the general public that there’s now access to most of the key apps people want and need, with over 500 apps added every single day (not week as incorrectly stated during the Microsoft presentation). With the introduction of Cortana to the UK and elsewhere around the world, it’s another feature that joins things like folders on the Start screen, improvements to Internet Explorer, and many more cosmetic changes that just make things more pleasant. Lumia phones also come with more software installed out of the box, which is particularly useful for the consumers that don’t download a lot of third-party apps (recent research suggesting a lot of people don’t download any). Offering upgrades to older handsets also gives people some more confidence, but it all still needs people to at least take some time to look at Windows Phone before making a buying decision. At the moment, I’m not sure people do. As ever, the Lumia range is packed with high-performance models, in a range of bright colours that breaks away from a lot of the more dull and dreary competition, but there’s still a long way to go. Microsoft paints a very positive picture, as you’d expect, but under the new ownership and a gradual removal of any reference to the Nokia brand, plus new devices coming from manufacturers that had all but given up on Windows Phone, it’s now or never.